The kids who made "wimpy"cool, are back in Diary of A Wimpy Kid Dog Days (in Theaters August 3rd)! My son and I had the opportunity to attend a press event for the film this past week. 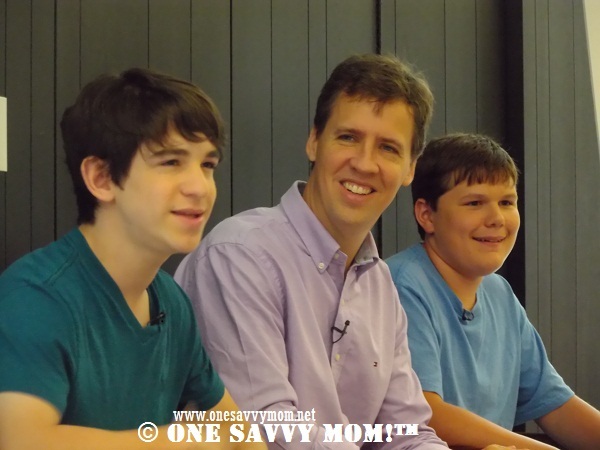 The event included an advance screening and interviews with Jeff Kinney (Author & Producer), Zachary Gordon (Greg), and Robert Caperon (Rowley). As the third film to be adapted from the best selling Wimpy Kid Series by Jeff Kinney, Dog Days is a laugh out loud, highly relatable comedy that the entire family can enjoy. The storyline follows best friends Greg and Rowley from the last day of school through the epic fun/fail days of summer that follow. While there are cringe worthy moments throughout the film (i.e. the Jefferson's communal ice cream cone!) that will just make you want to give this wimpy kid a hug, the film also has a ton of heart. Adapted from the best selling title by Jeff Kinney, the film follows the misadventures of Greg (Zachary Gordon) and his best friend Rowley (Robert Capron) as they navigate the "Dog Days" of Summer. While Greg would prefer to sit inside playing video games all day, his parents have bigger plans for him; like getting a job and getting actively involved in (much dreaded) sports. Rather than go along with his parents plans to de-rail his ideal Summer, Greg cooks up a plan that keeps his parents at bay so he can maintain his plans for a Summer filled with rest and relaxation. Parents, you'll find plenty of relatable (and hilarious) moments throughout the film as well. Like when Greg's father (Steve Zahn) declares that he is taking away his video game! Except he doesn't know which cord to unplug?! And , how about gifting a huge cell phone shaped like a lady bug (with only two buttons) to a teen boy?! The inevitable follies of parenthood have been captured in this film perfectly. The storyline in this film is pretty fabulous. At the crux of it all, there is a family (the Heffley's), and as imperfect and quirky as they may be, they have each other's backs. As I had mentioned, this film is an adaption from Jeff Kinney's fourth book (of the same title), in the Wimpy Kid series. The Diary of A Wimpy Kid book series has undeniably taken the country by storm, and while it is certainly impressive that each book in the series has topped many best seller lists', the impact that it has had on young reluctant reader's is all the more impressive. Jeff Kinney's style of writing is nothing short of infectious. Once kids start reading this series, they just can't stop! Along with a relatable set of characters, Mr. Kinney's comical cartoons lead and engage young readers in a way that is wholly unique to this series. Given the huge success of this series, it was suprising to learn of Mr. Kinney's early carreer struggles. As an aspiring newspaper cartoonist in his early 20's, Mr. Kinney struggled to break into the industry. During that time he began a journal as a way to document his journey, and soon found the concept for the Diary of A Wimpy Kid Series in his journal entries. "Eventually, I looked at the format that I was using and it was exactly the same format that I'm using in these books. And I said to myself you know, maybe that could be appealing. It could be like a Trojan horse, sneaking my comics into books, and maybe I'd have a better shot that way" said Jeff Kinney. With each new book, we're all anticipating where Greg's next adventure will take him; but don't expect to see a "Wimpy Kid Gets Married" book or film in the future. Mr Kinney says "I'm a G rated sort of guy. I don't really have an appetite for the problems that happen to kids when they get older. You're not going to see middle school kids face a lot of really grown up problems. I like to think of middle school as the last bastion of childhood. Rowley is a pure kid, you know? That's nice". So, what's next for the Diary of A Wimpy Kid series? "I'm working on another book right now for the series, I'm also really excited about making an animated TV special, a holiday special, around Wimpy Kid" said Mr. Kinney. 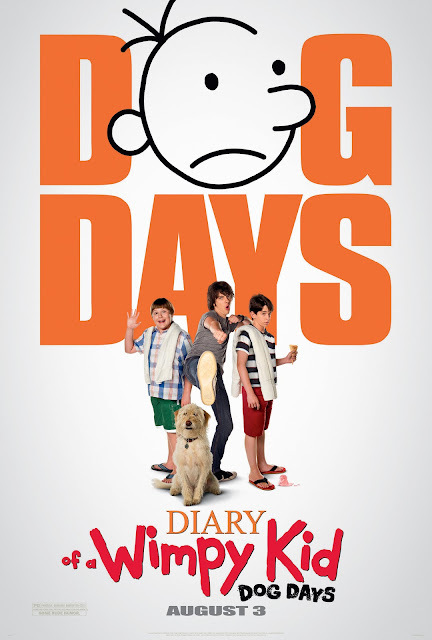 Diary of A Wimpy Kid Dog Days opens in theaters nationwide on Augusut 3, 2012. Stay connected and up to date! Get Wimpy! Create your own Wimpy Kid character from the movie Diary of a Wimpy Kid at Wimp Yourself!